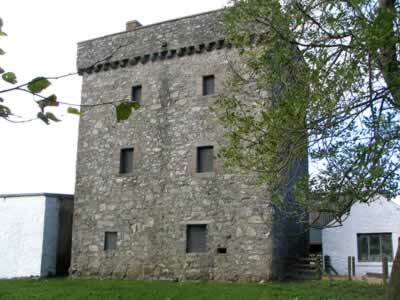 Drumcoltran Tower is a mid 16th century stone L-plan tower house, founded by Edward Maxwell. Of three storeys and a garret, the stair-wing is crowned by a caphouse and originally to the north, was a walled barmkin. With a vaulted basement and a first floor hall, the entrance and an upper corbelled-out stair-turret, are in the re-entrant angle. In the 18th century, the Irvings divided the hall and used the fireplace to make the basement fitted with larger windows, into a kitchen. A mile south is Corra Castle and 10 miles north-east is Mote of Troqueer. Drumcoltran Tower is located north of Kirkgunzeon, off the A711. 9 miles south-west of Dumfries, on the A711. The site is owned by Historic Scotland and and is freely accessible in daylight hours.